Myself and my daughter's love to make cakes, biscuits, anything sweet really, pesky sweet tooth. I guest posted over on emmysmummy last week when the kids and I were making chocolate cheerio cakes. 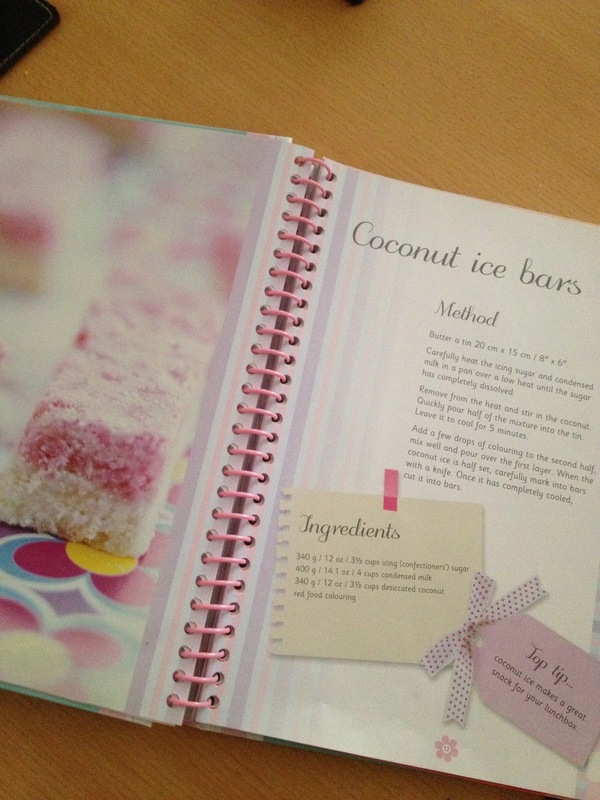 Well when we stumbled across a recipe for coconut ice bars in one of Freya's recipe books, I decided I would have a go at making them for the girls. I decided to keep it a surprise for the kids and they definitely didn't need to know that I was going to have to "test" them first, this has nothing to do with them being one of my all time favourite treats, no no, I have to make sure that they are good quality don't I, wouldn't want to feed my kids any old rubbish. 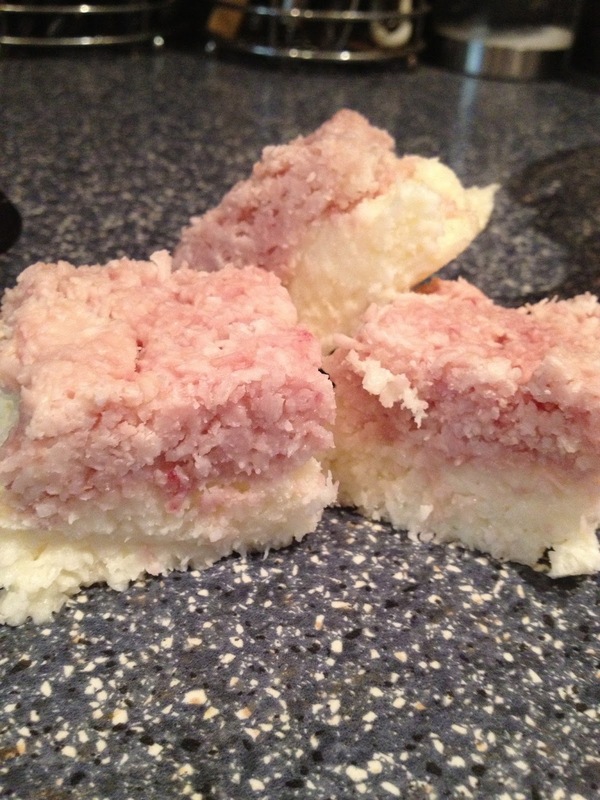 Well the recipe and method of making them looked fairly straight forward, so I was hoping they would work first time, the only thing I wasn't sure about was getting the colouring correct, wouldn't be traditional coconut ice without the pink and white effect. So off I popped round the supermarket with my shopping list in hand. 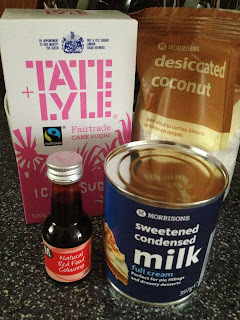 It cost me less than £6.00 for all of the ingredients and this was going to make roughly sixteen coconut ice bars, depending on how small you cut them up when they have set. * remove from heat and stir in the coconut, this bit you have to do quickly as the mixture stiffens quite fast. I was so impressed by the final outcome, not only did I manage to get the pink colouring of the top layer, it tasted exactly as I remember it, delicious, remember I did have to test them first. Do you have any other easy recipes to share or is there anything that you would really like to bake/cook that you haven't yet?? As always I really love your comments. Do you know what? I've never had these before! They look fab! Unfortunately I don't like coconut :/ I'm determined to do some more baking with my two. Infact we're just about to make biscuits this morning - but from a packet mix! Not something I would normally do but Ben was given it as a gift and he's excited about making Toy Story biscuits! these sound lush!! i am loving the sound of these! This brings back memories of childhood! My kids are heathens, they hated it when I made it! Yum, I love coconut! And they are a pink which will go down well with my daughter.